Any Season is a Good Season to Tint Your Windows! Tinting your windows in the fall and winter months may seem like a silly thing to do. Top Edge Window Tinting is here to tell you that couldn’t be further from the truth. Even with the colder months steadily approaching, the sun is still shining bright. The fall and winter months bring colder air but definitely not less sunshine. You still need to help protect yourself, your loved ones and your personal possessions from the damaging UV rays of the sun. A lot of the suns heat is reduced in the winter because of the cold air, but the UV rays that fade upholstery, cause sunburn and skin cancer are actually amplified 85-90% when there is snow on the ground. Most window films will help reduce up to 99.9% of these harmful UV rays and will help keep your possessions from being seen. Glare can be reduced significantly as well with window film. During the winter, when the leaves are all gone and the snow has fallen, glare is intensified because it is reflecting off the snow at a higher rate than it would during the summer with trees full of leaves and no snow on the ground. Think about looking outside at night when there is snow on the ground. The darkness from the sky is brightened up by the whiteness of the snow. Now think about how much more intense that brightness is when the sun is shining! Reducing some of the visible light coming through your car windows will help increase safety during the winter months. When you think about car window tinting on Long Island, you probably think the tint will help reduce heat in the summer months. What if we told you tint could also help retain heat during the winter? It’s true, it can! When the heat hits your window from outside, the heat travels through the glass and transfers to the air and other objects that may be in contact with the window. This process is called conduction. In the colder months the process of convection is more of our concern. When you are heating your car in the early morning, the heat is looking for the cold spot to heat it up. When the heated air hits the interior surface of the glass the air is cooled, becomes denser, and drops to the floor. When this happens more heated air rushes over to take its place and heat the area back up. You may recognize this as a cold draft. So what’s the first thing you do, blast the heat. Unfortunately, each 1-degree increase in a temperature setting increases energy use by 2%. With window film on the glass acting as insulation, the heated air no longer recognizes the window as the cold spot and can help regulate the temperature of the glass. 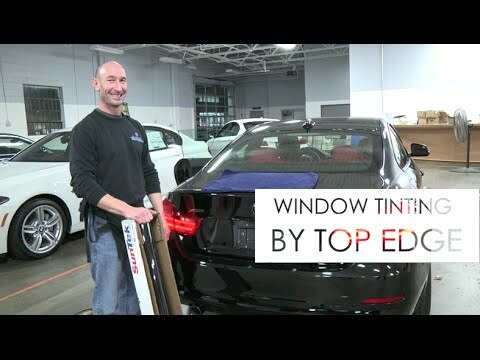 Top Edge Tinting offers premium car window tinting and paint protection (Clear Bra) services near Long Island. Contact us today!